Ryan O’Connor holds up one of the big tuna that showed up off the south end of Cerralvo Island and surprised us all late in the week. Ryan is from Miami. This fish was close to 100 pounds and he and his dad put 4 nice fish in the boat! I was as surprised as any when Chuck Eaves and Captain Jorge pulled this huge slugger out’ve the fish box on the panga! WHOA!!! 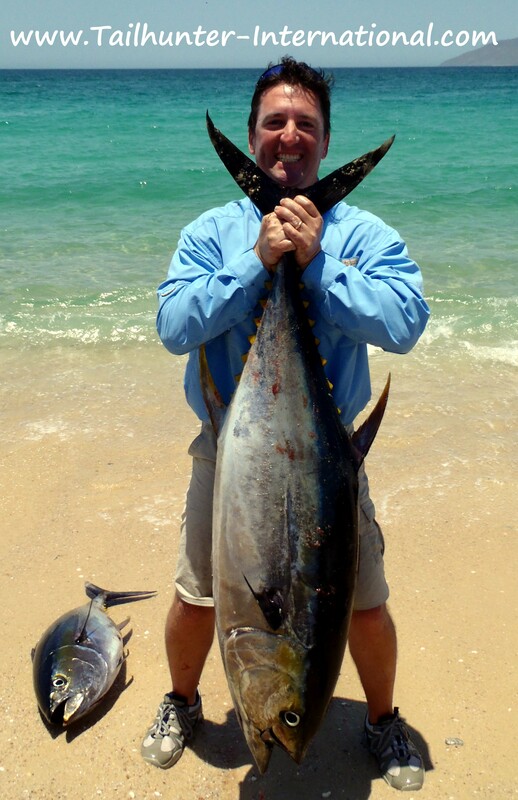 Close to 100 pounds and not only the first tuna of the season, but the largest as well. Great way to start! The fish initially were found running with porpoise. More video of Chuck below this weeks’ photos! Good start for their first day of fishing for Curt Weiss and Henry Hernandez from Florida who pose with 4 of their big yellowfin tuna in the shallows at Punta Arenas. These fish were the first tuna run of the season we had seen! Ben and Kendra Gillette usually spend their anniversary in Hawaii, but opted for La Paz this time. Ben had wanted to use his flyrod, but when these big tuna showed up he wisely put down his flyrod and grabbed the bigger conventional guns! Big smiles to go along with their nice fish! 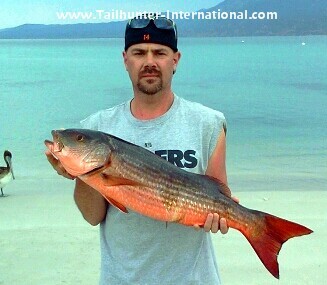 Rick Walker from Washington, has had better trips to see us but ran into some of that tough fishing early in the week. 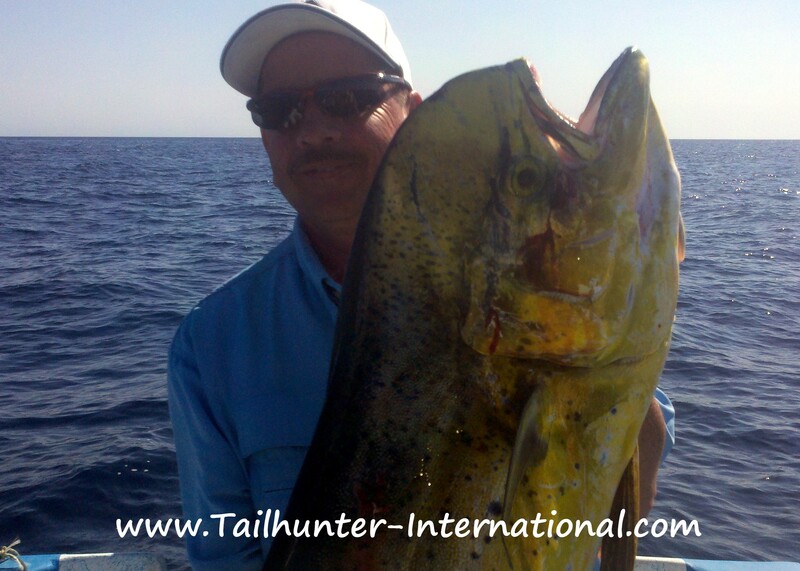 However, he did put the largest dorado of the week aboard one of our pangas. The dorado are here, but the bite has been scattered. One day on…next day off! Again…thanks Hawk for all the photos you get me! He got me another photo of Nelson Kwok from N. Cal with one of the yellowtail he got go go along with the big amberjack (shown above). We thought the yellowtail had left us over a month ago, but with water temperatures all over the place, yellowtail are showing up in the cooler waters. Video Clip: A short video clip of Chuck Eaves’ big tuna being pulled from the panga. My video camera went on the fritz right after this or I would have had more video footage of all the tuna we got! FLURRY OF NICE TUNA HIGHLIGHT OTHERWISE UNUSUALLY SLOW WEEK! This past week was perhaps the strangest week of the season. Maybe it was a continuation of last week. In word, maybe “strange” wasn’t strong enough…it stunk! We have jokingly been blaming the eclipse and big waves generated from the hurricane hundreds of miles to the south, but nothing adds up. More likely, it’s been a combination of a number of factors. It would seem the conditions are all good. Water temps are in the low to mid 80’s and air temperatures have been in the mid-80’s to mid-90’s. Perfect vacation weather! But you really have to look closer at what the satellite readings are telling us about the surface temperatures. Around our Las Arenas/ Cerralvo Island areas, the surface water temps are in the 80’s. 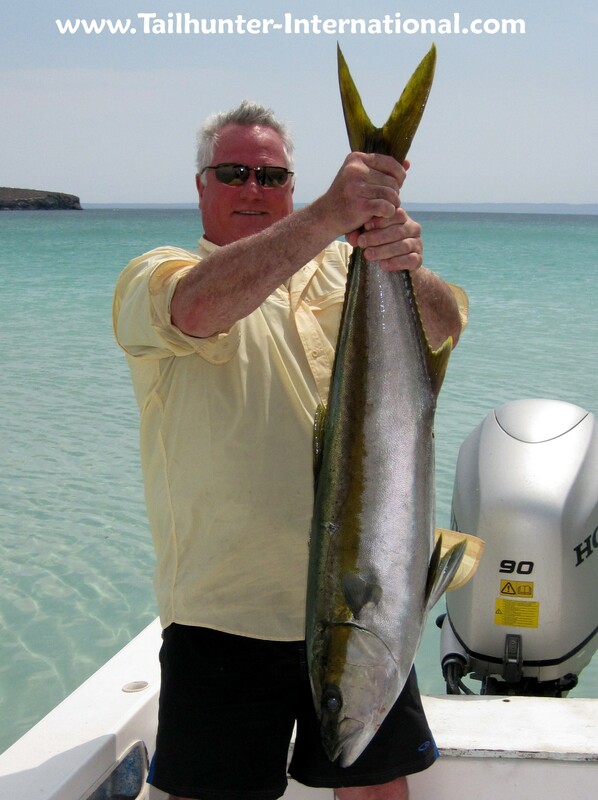 Good warm water for species like dorado, wahoo, billfish, etc. 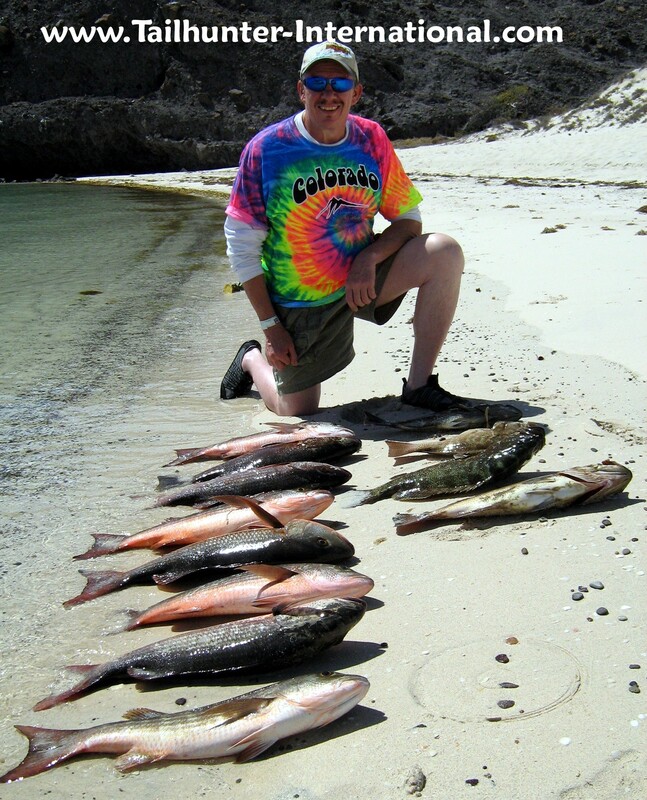 But north of La Paz around Espiritu Santo Island, the water temperatures are around the mid-70’s! Those are more like cooler spring-time temperatures that produce yellowtail, pargo, cabrilla, sierra, and more inshore fishing. But…75-80 degree difference… That’s quite a change. Plus there are fingers of warm water in the cold areas and fingers of cold water in the warm areas. I can only speculate what it’s like UNDER the surface! So, I think the fish are all messed up! I think they are ready to take off and go, but we’re just going through a really rough transition time between our spring and summer conditions. Add to that the fact that there’s a huge bank of cold water down as cold as the mid-60’s hovering off Cabo San Lucas and the East Cape to our south that’s really hurting those areas AND threatening to move up into our area and we end up with a real “chop suey” of conditions! So, not only are the fish confused, but moreso, it has affected our bait situation. Some days bait is almost impossible to get. This is mostly with our Las Arenas fleet which has resorted to using frozen ballyhoo, cut squid, live pilot fish, caballito jacks and liso (mullet). It’s pretty hard to chum with these species and I especially feel badly for many of the flyfishers who come to La Paz this time of year when normally we have tons of sardines to chum up the fish for them. For our La Paz fleet, the bait has been a little easier, but still tougher than normal. We’re getting some sardines but supplementing that with mackerel and caballitos. Bottom line is that there’s not many bullets for the guns! 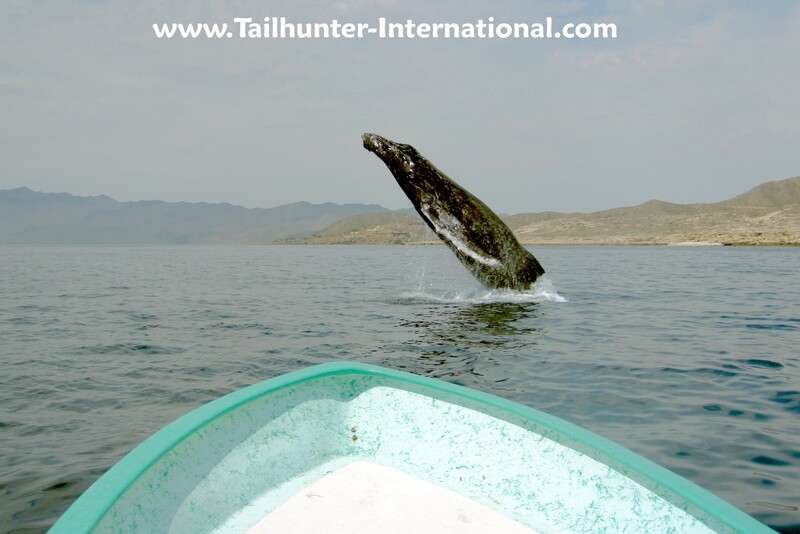 For our La Paz fleet, we have been surprised by the re-emergence of yellowtail again. We had a great bite going for 3 months that just simply fell off the boards about a month ago. 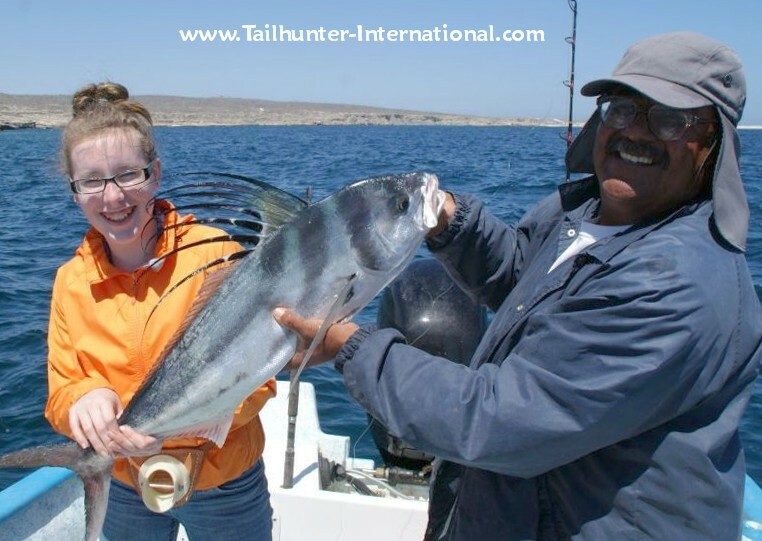 Then, with the re-emergence of cold water, we suddenly have yellowtail biting again as well as pargo, cabrilla and little flurries of dorado and marlin in the warmer areas. … a big school of moving dolphin came through. 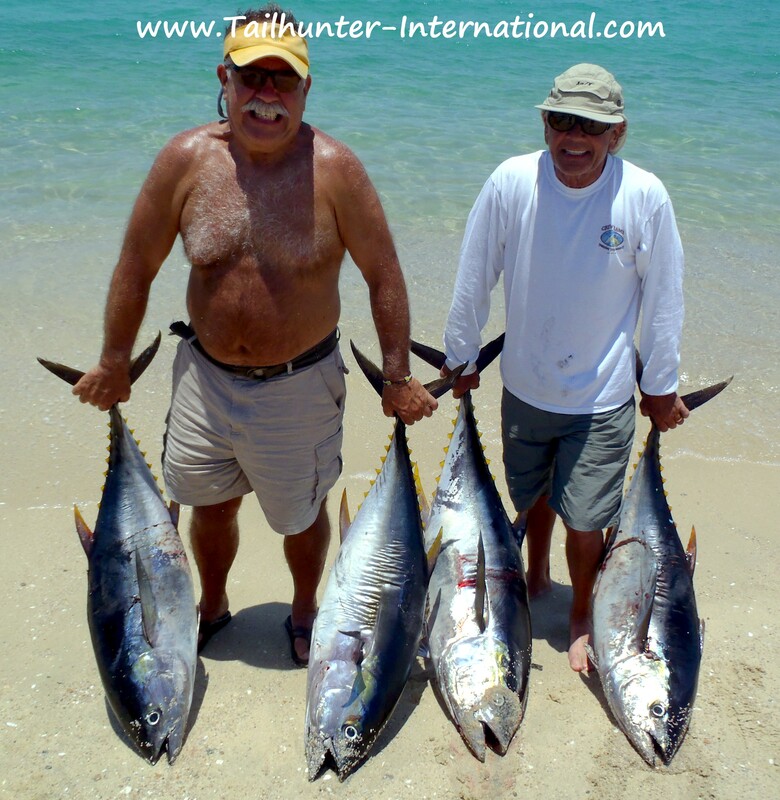 A few of our boats chased them and got immediate hook ups on slugger-sized yellowfin tuna. Other boats joined in. Instead of moving off with the dolphin, the tuna stayed…and bit! And for a few great hours guys had bent rods on 40-100 pound yellowfin that just spanked the guys! 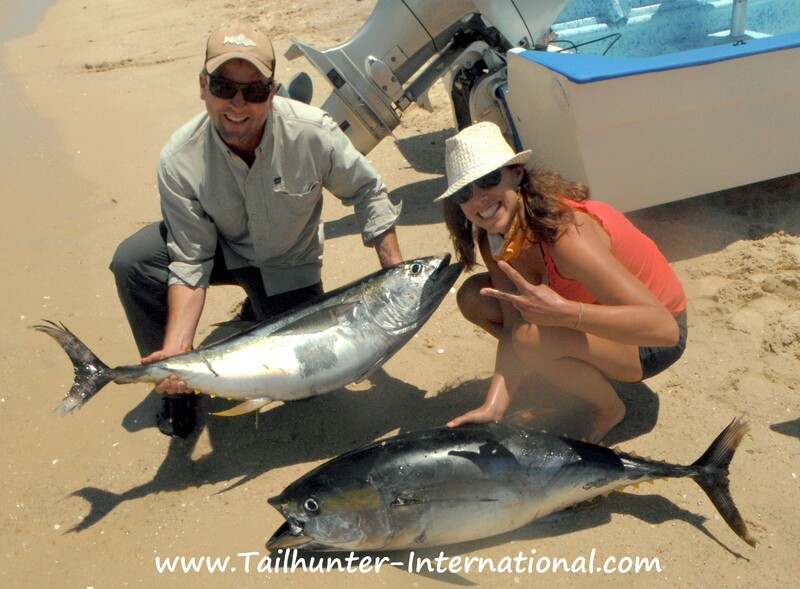 All our pangas got 1-4 fish each but all of them lost 2-5 other nice tuna as well. They were pretty tired at the end of the day but these were feisty hard-charging fish. The next day, most of the guys didn’t want to chase tuna as they were pretty beat up so it’s hard to know if the tuna stayed around, but inshore, the guys found roosters between 10 and 70 pounds as well as some small dorado and a few marlin and sailfish hookups that were either lost or released. All roosters were also released. So…I don’t know where that leaves us, but I’m encouraged by what we saw at the end of the week and hope things settle down! Happy Memorial Day week and weekend everyone! God bless all you vets for your service! 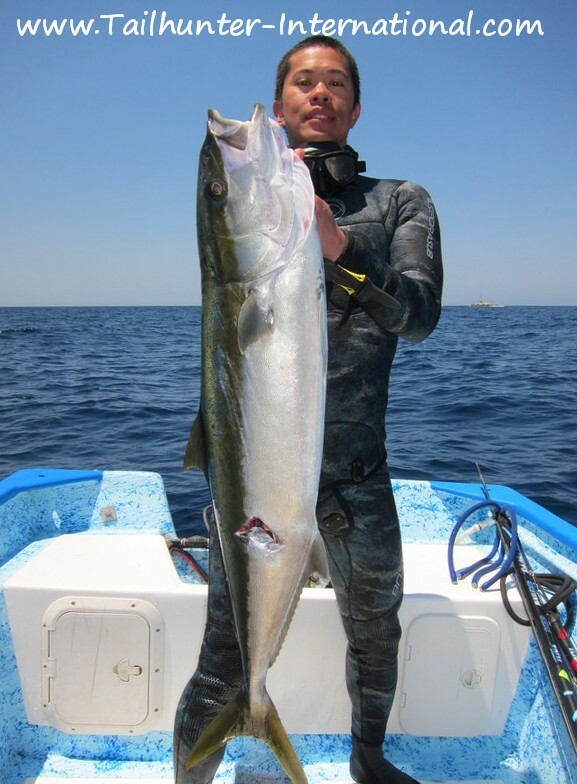 No doubt dorado…like this nice bull take between Cerralvo Island and the peninsula are around. Not in great numbers, but it’s surprising that we’re getting big bulls of this quality so early. Two legends go fishing. On the left, Hall of Fame NBA player Rick Barry poses next to legendary owner of the Giggling Marlin Restaurant in Cabo Lucas, Gary Wagner in front of Gary’s place at Bahia de Los Muertos. The north side of Cerralvo Island turned out to be one of the more productive places in an otherwise slow week of fishing as huge amberjack, big cousins to yellowtail, put on a bite. 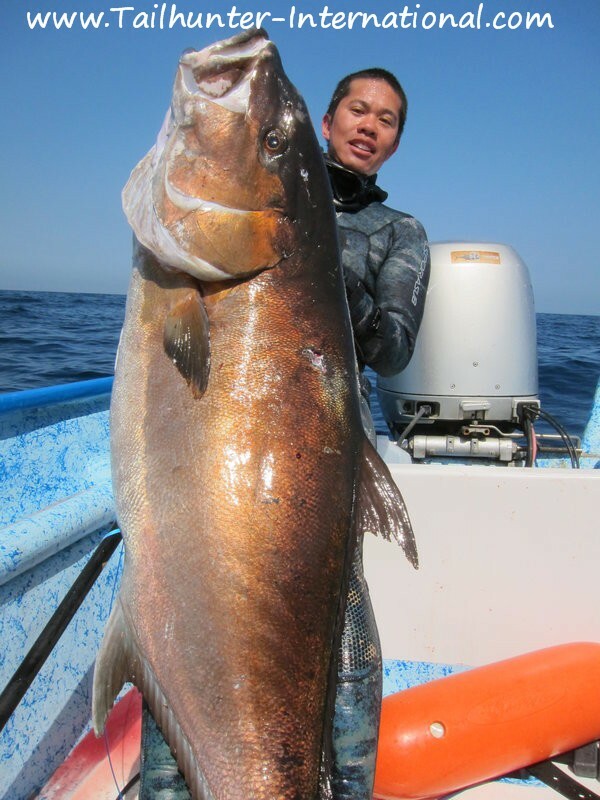 The largest of these three amberjack weighed out at 87 pounds! I usually don’t post up many marlin photos over the years for several reasons. First we encourage catch and release so a majority of our hooked marlin get let go and secondly, well, many marlin bust off! We had several hooked up this week that are still swimming after breaking off. More marlin seem to be showing up, but not all are willing to take a bait or lure just yet. This striper ate a trolled jig. 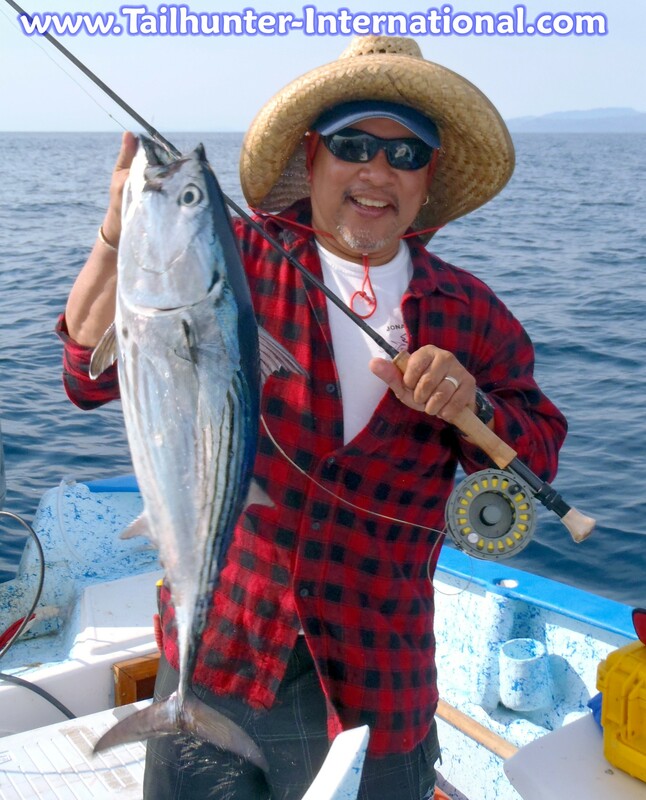 Even when fishing is slow, often our fallback are the feisty tough bonito that can really chew up tackle. 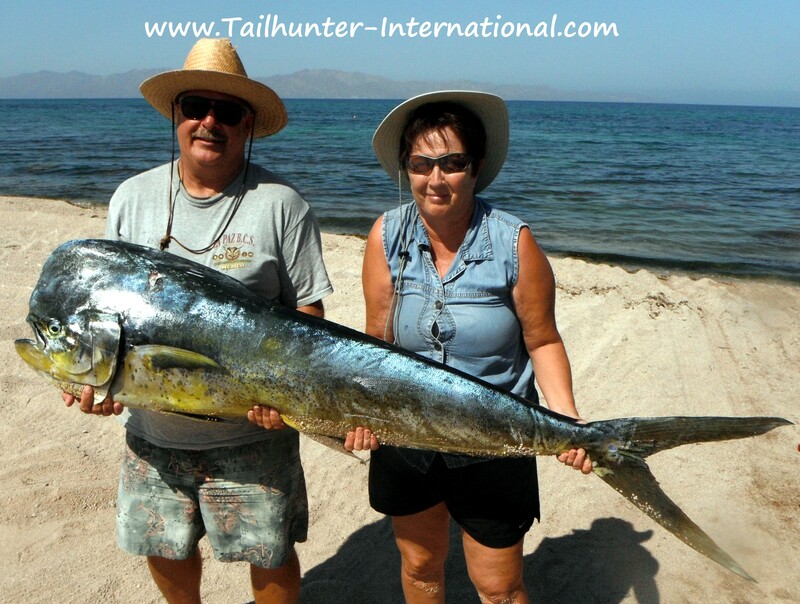 Captain Yofo of our Tailhunter Las Arenas fleet took a shot on a flyrod and found himself in about a 15 minute battle on a 10wt fly rod. The fish was released. In a few words, fishing this week around La Paz was…”WEIRD…SCRATCHY…SPOTTY.” Things are definitely changing and we’re going through that transition right now between the cooler waters and spring and the warmer summer waters. The fish are going through it too and so they’re adjusting. It’s a bit like when you bring a goldfish home from the church carnival in the little plastic bag. At home, it takes awhile for them to get acclimated to their new surroundings in the home aquarium with temperatures and oxygen levels different. I think that’s what happened this week. Every day was different. Some days the fish bit. Some days they did not and it was like pulling teeth. One day one species would be the hot species and the next day a completely different species would take center stage and the fish that were hot the day before, were nowhere to be found! The other thing was that bait got scarce! Sardine schools, the foundation of our fishing…just vanished. We got a little, but it was like pulling teeth to find enough to fish. Even the bait guys had problems finding it or found only a handful to sell or, it took the better part of the morning looking for bait to start fishing. So, of course, that also reflected on the fishing numbers. But, I’m not sure that would have made that much of a difference either because some folks went to trolling lures in the absence of bait…and they didn’t exactly light the world on fire either! AND THIS WAS NOT A FULL MOON! AND THERE WAS NOT MUCH WIND EITHER! So, all you folks that think the fish bite better ALL the time during a dark moon, don’t say I never told you so! This was bad all over. I hear on the East Cape and down in Cabo, the bite just dropped off the charts all of a sudden as well. Hopefully, it’s just the little dark before the big fish explosion! So, what did we catch? Well a little of this and a little of that…roosterfish along the shores were still active. Pargo and cabrilla also bit, but that always works better when you have bait! 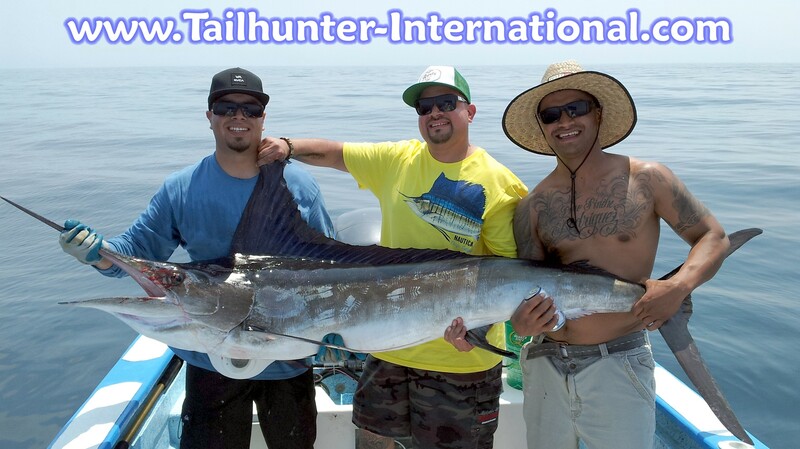 We had some really exciting catches on big amberjack and some very nice dorado were picked up as well as a few marlin. Here’s one example of crazy fishing. The awesome yellowtail bite we had going for 3 months fell apart about 3 weeks ago. Waters are just too warm. 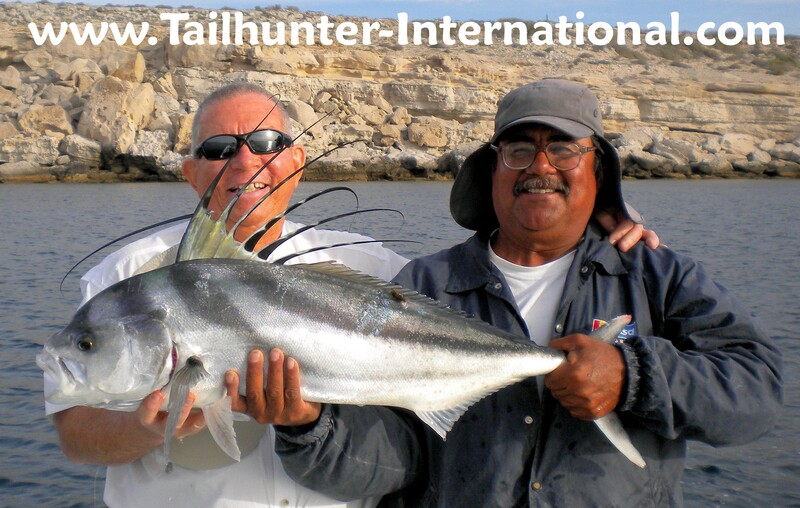 We’re gearing up for the bluewater species like dorado and tuna. 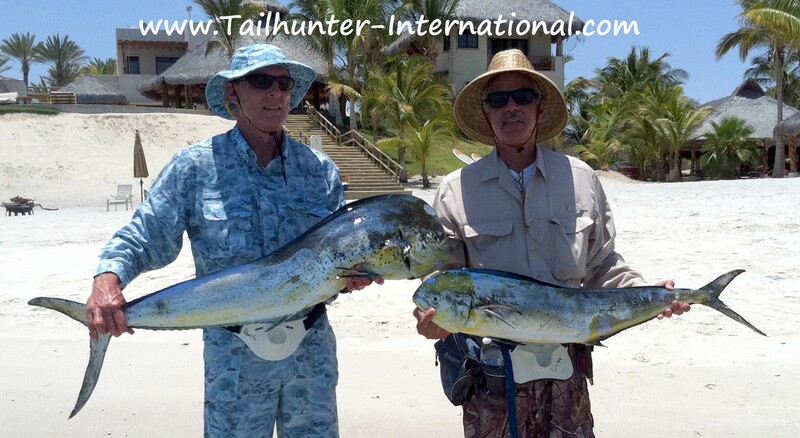 One of our pangas went out for dorado and came back with…two nice yellowtail! Go figure! The guys fishing conventionally, did better since they had more to work with. I really felt badly for the flyfishers. With no bait, it’s hard to chum fish up and get them interested. Fortunately, we didn’t have any flyfishers this week, but I know other friends who were out there doing their best in a difficult situation. They resorted to trolling or else using hookless lures to tease fish within casting range. As for what’s coming up? The conditions look ripe. The waters look good. They are already up into the low to mid-80’s on the surface. Air temperatures in in the mid-90’s. I continue to think we’re right on the cusp of some really good fishing! Our amigo, Chris Cribbs, who visits us twice a year is the man behind the fish…a big rooster…one of the largest of the week when the roosters seemed to be all over. That’s the sand of Las Arenas Beach behind Chris. The rooster was released. Maybe it was the lucky shirt! If it’s his lucky shirt, I want one! Althought it says “Colorado”…. Actually, Art lives and works above the Arctic Circle as a medic where it’s often 70 degrees below zero! Enjoying the sunshine for the 2nd time this year already, Art really got into the pargo near Espirtu Santo Island having a banner day on the rockfish…maybe the best of anyone so far this year! We love father-son trips and when the kids outfish dad, it’s even better. 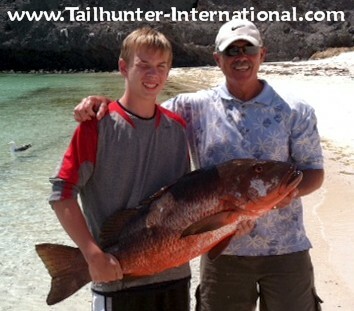 Tim Stoklosa poses with his son, Sam, who blew up this huge dog-tooth snapper north of La Paz fishing with Captain Raul. It’s quite a feat to get one of these out’ve the rocks. Over two days, the guys also got some nice roosterfish as well. 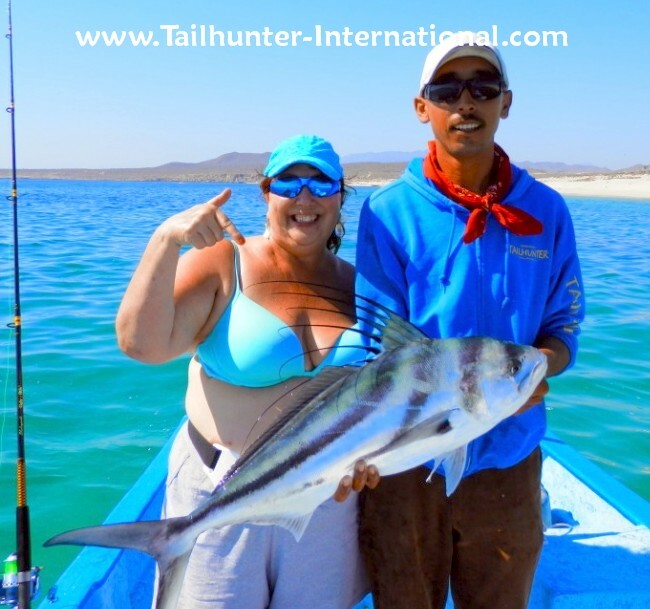 On her first trip to La Paz and first time ocean-fishing, Debbie Devine got herself a nice roosterfish on the water with Captain Pancho near the Las Arenas lighthouse. The fish was released after the photo and Debbie lives in Colorado. Mark Diehl had time for only one day of fishing on a visit from the Portland OR area and made the most of it with this trophy roosterfish that he photo’d and released. Punta Arenas in the background which was the scene of great rooster fishing all week. The sheer cliffs of northern Cerralvo Island are the backdrop for Gonzo Rodriguez showing off one of his big mullet snapper (pargo liso) fishing with Jim “Hawk” Davis. Love it when the youngsters are all smiles like Olivia here with Captain Victor and her first roosterfish! ROOSTERFISH AND PARGO GO OFF BIG TIME! Roosterfish and pargo really kicked it into a higher gear this past week. As air and water temperatures ratchet up bit by bit and everyone is anticipating the incoming warm-water species, some days it seems like the roosters and pargo just dog-piled onto each other! With temps in the high 80’s and into the 90’s, the roosterfish were especially voracious. I guess there’s a reason that they call this area the “Roosterfish Capital of the World.” We didn’t get any monsters, but fish in the 5-40 pound class were pretty common. Live sardines slow trolled or drifted were good as were Rapalas and other crank baits. The roosters were in their normal spots along the sandy areas literally terrorizing schools of bait right up to and onto the sand! However, we were also getting them around the rocky areas of the islands as well as over reefs and high spots where we were fishing for pargo and cabrilla! The faster and more mobile roosters often hit the baits before the pargo or cabrilla could get to them and some of the roosters would blow up in spectacular fashion of of the water. We were even hooking some roosters just offshore in deeper water! It’s a great time for light tackle, spinning gear and the flyrods as well. 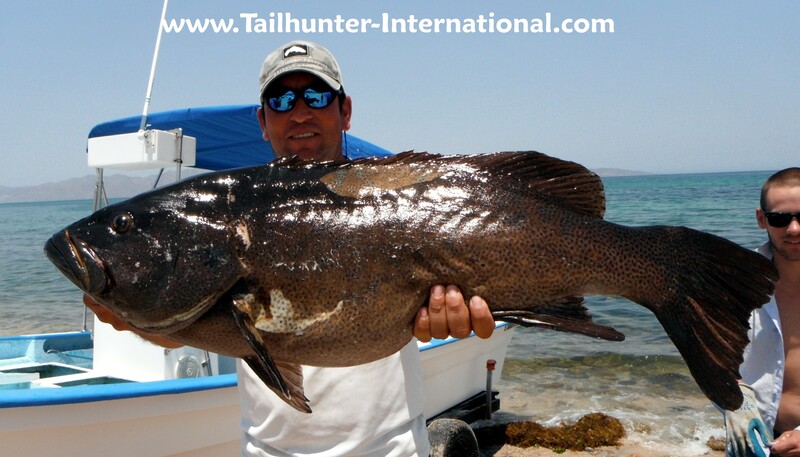 As for the pargo, they are mixing it up with the big cabrilla (seabass) and smaller grouper…that we can stop! Remember that these fish are often in extremely shallow waters and the rocks are almost right below the boats. As soon as you hook up, you have to turn these fish or you’re done…right into the rocks and there’s just no way to win. The cabrilla and pargo we are able to stop are in the 5-20 pound class, but much much bigger fish get away with a hook in their jaws and a length of shredded line trailing behind them! Most of the anticipation comes from the other condtions we’re seeing. As I said last week, everything just looks primed to blow up any day. Signs of roosters are just one indication, but there’s a ton of sargasso out there floating around and flurries of dorado have been seen under them. 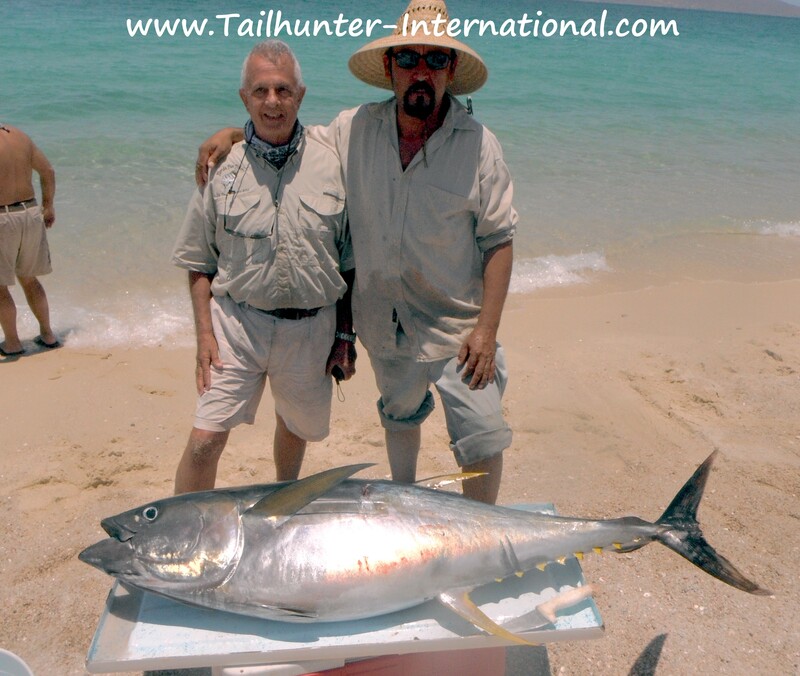 As well, schools of fast moving tuna have eluded the pangas and marlin are just starting to wake up and we had several hook ups and break offs this week or, more often, the marlin are just sitting on the surface and not much interested in anything you throw at them, short of running over them with the panga. Sometimes you are running the panga and hit a “bump bump” and the panga takes a little hop and then there’s a marlin greyhounding away as you realize you just ran over him! We have over 100 video clips on YOUTUBE so feel free to subscribe so you get all the video updates. 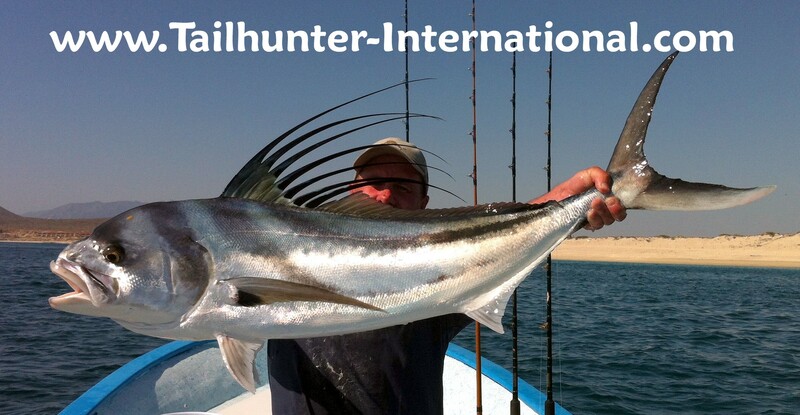 Also, we’re on Facebook as well under Tailhunter International Sportfishing if you’d like to see our daily updates! Hope you all had a great Mother’s Day and have a great week! Not much left of the massive yellowtail bite we had going on for 3 months, but we still found a few. 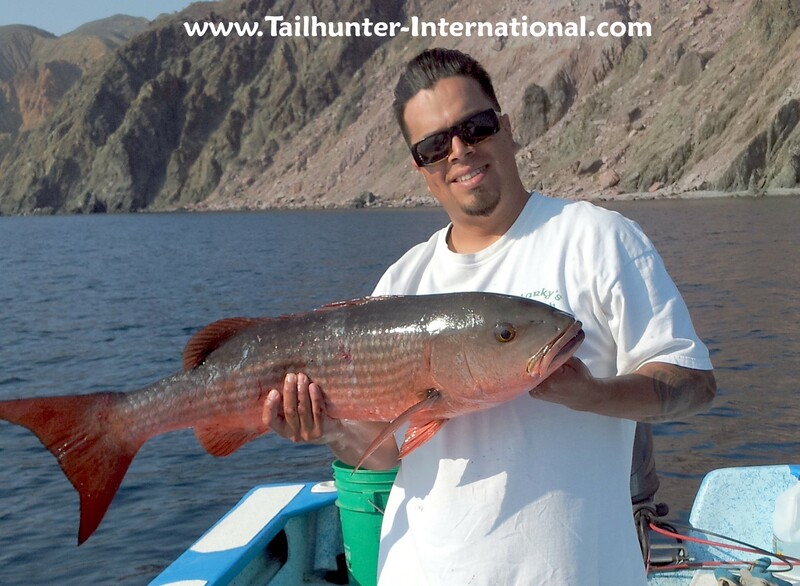 First time angler with us from Florida Joe Hussin hefts up one of several they found fishing the west side of Espirito Santo Island. In the past few weeks, roosterfish have really taken off. None of the big boys that La Paz has historically been known for but fun school-sized 20-40 pounders have not been uncommon. Captain Victor here helps our buddy Bob Solee of B & B Fishing Rods in Portland OR to hold up a nice pez gallo before releasing it. That’s the rocks of Punta Perico in the background about 50 yards back. Although he’s not smiling, Belmond Mann and his wife Amy love fishing with Captain Archange at Las Arenas and on this particular day, Bel surprisingly outfished Amy putting this nice pargo liso in the boat. Over two days they got a variety of pargo, cabrilla and snapper. Typical of the weekly bite. Charlie Gibson fished with us for a while week. Charlie just had his right hand (reeling hand) surgically repaired so when the yellowtail bit off Espiritu Santo Island, he struggled mightily to get the fish to the boat! But, he gritted it out and got 3 ‘tails. Yes, marlin have started to show and, although they’re not quite in the feeding mode, it could happen any day. The three Rodriguez brothers hooked this one which was not able to be released. It was caught off Cerralvo Island. Reports say that the high spot at the 88 has stripers sitting all over it just waiting for the water temps to go up a tad! Don and Deb White from Oregon come to see us several times a year and always do well. All week, Don was the “King of Cabrilla” taking big seabass after big seabass. 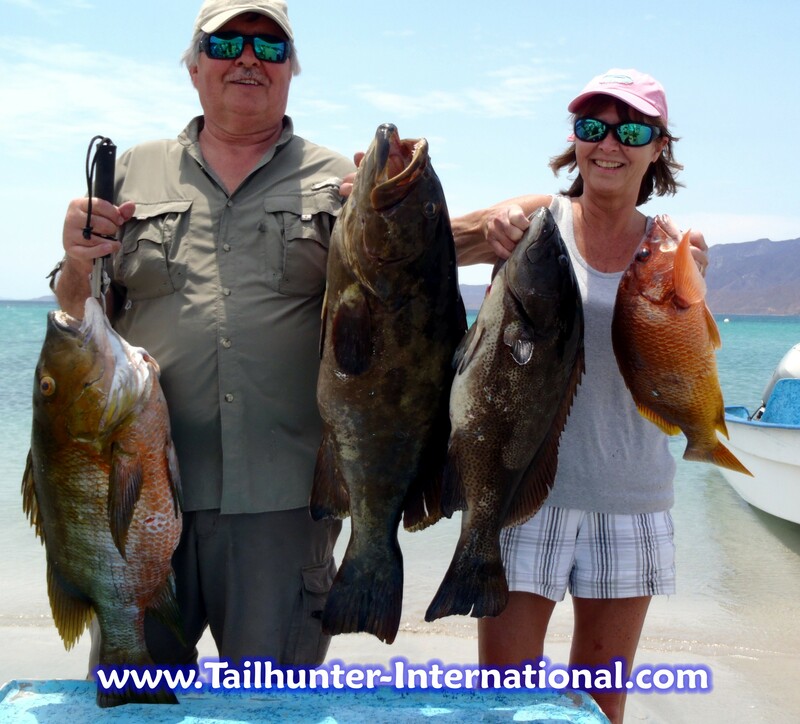 Here, he and Debbie show off two huge cabrilla, a snapper and a barred pargo. Every now and then they even let me out on the water! 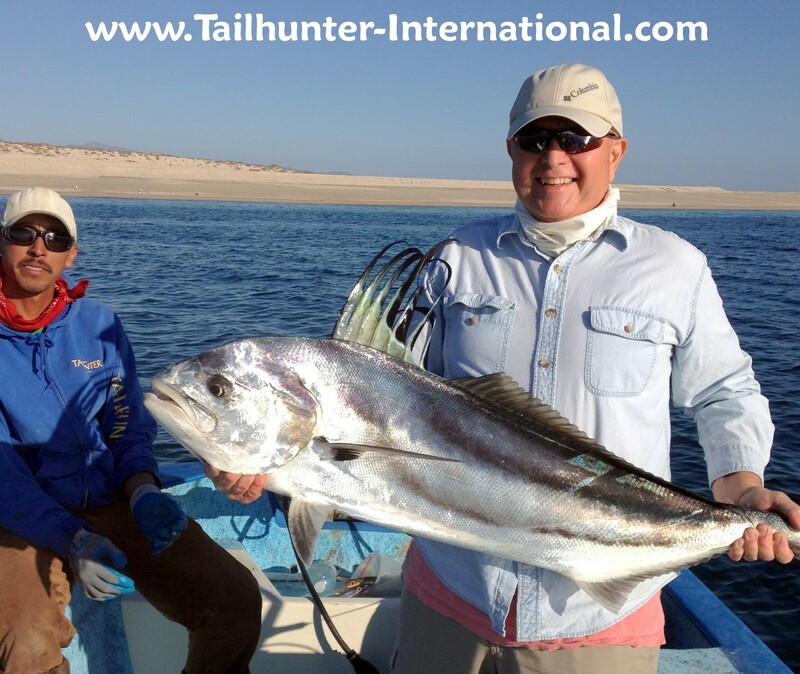 I wanted to stay out’ve the way our other pangas so I grabbed a flyrod and we went out to the bonito ground to experience the “pain” of pulling on 10-15 pound horse bonito on a whippy 10wt flyrod…just for fun! OUCH! I still have bruises on my knuckles and forearm. None of these fish took less than 15 minutes to put in the boat! You veteran flyfishers can attest to this! Tough tough fish! We released all of them! Just had to share this amazing photo with you. Joe Hussin from FLA was fishing with us this week and were in Capt. Archangel’s panga and just about 200 yards of Punta Perico a huge humpback kept breaching around them to the point where they were getting sprayed and splashed. The last one was no more than 30 feet in front of the panga. At that point Capt. Archangel said, “We’re outta here!” Joe caught this amazing shot during on of the jumps…just right…with his iPad!!! It’s poster quality! The waters are full of life right now…porpoise, turtles, whales, birds…an amazing place to be this time of year! MIXED WEATHER AND MIXED FISHING ADDS VARIETY! It was a mixed week on all levels this week. We had hot muggy sunshine to wind to rain to flat seas and bouncy rolling chop. Sometimes the fish bit better when it was rough. Sometimes they bit better when it was flat as glass. No rhyme or reason. One day , they would all chase baits. The next day the fish would turn their noses up at the bait and only want slow trolled slices of dead fish. Or they wanted only dead sardinas. As one of our clients said ,who fished with us all week, “It was like the fish were picky kids never knowing what they wanted!” The game of the week was trying to figure out where they would be….what they would want…and what they would eat. It would help that there are so many different conditions on top of the fact that there were so many different species of fish as we hit that “transitional period” when the waters are getting warmer, but there’s some areas of cold and some areas of warmer waters. These differences in water temperatures could be horizontal where you would be in green cooler water in one spot, but move 100 yards to the side and the waters would be warm clear blue. Or, the thermoclines could be vertical. On the surface it could be 75. A few feet down it could drop 10 degrees or, the temp change might not occur for 40 feet. I was scuba diving last week and I ran into thermoclines on many levels and saw different fish depending on the water temperatures and feeding in different thermoclines. For instance, I found 69 degree water at 25 feet down, but at 40 feet down, I found 72 degree water…it was actually warmer the further I went down. I found pargo in the cooler water swimming but bonito and jacks swimming in the warmer water further down. Anyway, the bite reflected all the change. I gotta tell ya…the ocean is really full of life, even if you’re not fishing. But the conditions are such that all of us are saying that it just looks like it’s gonna bust open. There’s so much variety out there. 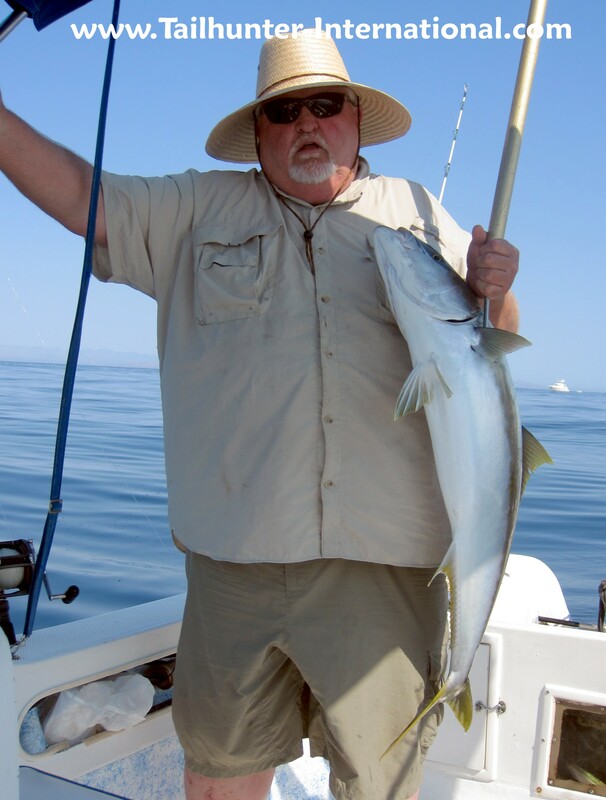 Cooler water fish like yellowtail and big amberjack are sporadically still around. Pargo and big cabrilla are feeding in the rocks and shallows. Along the beaches, the roosterfish are getting livelier as well as the jack crevalle and occasional pompano. Where the water is cooler in the shallows, there are still sierra to be caught as well. Offshore, sargasso weed is building up and literally strewn across the ocean. Schools of dorado are starting to show although not necessarily ready to eat just yet. Same with the marlin. The big guys are sitting on the surface just sunning. Give another few degrees in water temperature and they’ll start to chew. Just a matter of time. A few were hooked! Flurries of fast moving tuna have also been spotted as well.